CHICOPEE - A Danish energy company is hoping to bring a new and innovative technology to turn trash into renewable energy to the United States by building an $80 million waste management plant in Western Massachusetts. DONG Energy REnescience is considering six sites in the region, with five of those in Chicopee, to locate its new trash-to-energy plant. It is also considering locating a second plant in the eastern part of the state in the future, said R. Stephen Lynch, senior project manager for MSW Consultants, which is providing market research and analysis for DONG Energy REnescience. "It is an exciting, environmental-friendly technology to change the way waste is handled," said Simon Chignell, a DONG Energy executive. The technology has been tested in a demonstration plant in Copenhagen, Denmark, for years. The company opened its first large-scale plant, which can handle up to 132,000 tons of solid waste a year, in May in the United Kingdom. The plant is not working at full capacity yet, Chignell said. The REnescience technology begins by taking in regular household waste that has already been sorted for recyclables by residents. The trash is dumped on a tipping floor and large items, such as tires and propane tanks, are physically removed, Lynch said. The trash is fed into horizontal tanks filled with lukewarm water which rotate slowly. Enzymes are introduced to speed up the process of breaking down and liquefying the organic material, he said. After the 18-hour process, everything in the tanks is automatically separated, he said. The liquid is piped to an anaerobic digester, where it is converted to a biogas product similar to the methane created in the breakdown of organic materials in landfills. That biogas is combustible and will be burned to create electricity, he said. Any glass, metals and plastic that homeowners fail to remove for recycling are super cleaned in the process so even labels and glue are washed off and broken down as organic materials. Those recyclables are separated out to be sold to the recycling market, Lynch said. The remaining trash that did not break down, such as the remains of plastic bags and very thin plastics, is used to create an engineered fuel. That fuel will be shipped out of state and can be used as an alternative for a coal-burning plant to create electricity, he said. Also left is a small amount of particulates that settle in the bottom of the tank, such as tiny pieces of broken glass and pebbles. In Europe, those substances are used for road paving material, but that has not been approved in the United States, so another use will be found for the byproduct, Lynch said. The process is comparable to the way methane from landfills is used to create renewable energy. The difference is it takes 20 hours instead of 20 years to break down materials and convert them to a usable gas, Chignell said. "If we succeed, we will offer a cost-effective place to recycle more and we will create 24 full-time jobs," Lynch said. An additional 100 or so construction jobs will be created during the building of the plant, he said. Until the DONG Energy REnescience technology was created, the only effective way to recycle trash was to pull out metals, plastics and paper, but studies show homeowners still miss between 20 and 25 percent of recyclables, Lynch said. More advanced systems also have homeowners separate out food waste and other organics to be composted, but few communities in Massachusetts have a program to do that, Lynch said. The new process is much faster and eliminates human error in separating out recycling materials. It also breaks down trash that cannot be recycled, such as soiled cardboard and paper, he said. The company will make money in multiple ways. Communities will first pay to dump their trash at the new plant. Because the company will need at least 100,000 tons of garbage a year, it will have to offer competitive fees, usually called tipping fees, to ensure enough communities contract with DONG to dump their trash. It will also sell the recyclables, but the market tends to be volatile so it will not be a big source of income, he said. Another important source of income will be selling the renewable energy produced. In addition, the company will be eligible for tax credits and renewable energy credits for every megawatt of energy produced. DONG officials have been working with the state Department of Environmental Protection and the Department of Energy Resources on the permitting process as well as discussing options for tax and energy credits, Lynch said. Gov. Charlie Baker and Lt. Gov. Karyn Polito have been pushing to limit the amount of waste dumped as landfills continue to fill. The state offers grants and other assistance to communities to help enhance recycling programs. The state government also has supported offering tax incentives and credits for those producing alternative energy. "The Baker-Polito Administration remains committed to diversifying the Commonwealth's energy portfolio through a balanced approach, and will continue to support innovative clean energy technologies to ensure that the Commonwealth both meets the demands of our ratepayers and reduces carbon emissions," said Kevin F. O'Shea, communications director for the Massachusetts Department of Energy Resources. When DONG Energy, based in Fredericia, Denmark, decided to expand into the United States, the company did extensive market research to find the best places to locate a plant. Massachusetts and locations in California and Maine were identified as the ideal spots, Lynch said. Massachusetts was attractive because of the government's environmental policies to move toward cleaner energy sources and a zero waste stream, the need for alternative ways to handle waste and the availability of the clean energy credits, Lynch said. The $9 billion company, one of the leading energy groups in northern Europe, is already involved in the Bay State Wind project off Martha's Vineyard, so it made sense for DONG Energy officials to continue work in the state and bring its innovative technology to Massachusetts, Lynch said. Chicopee came to the forefront in part because of the imminent closing of the privately owned Chicopee Sanitary Landfill and because there were a number of suitable sites for the plant in the city. In addition, city officials have been very helpful in trying to iron out permitting details, Lynch said. 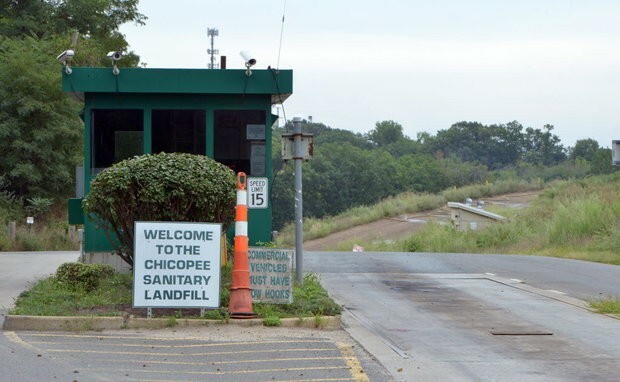 The company will need about six acres for the plant, which will be large enough so that the entire operation, including trash trucks driving in to dump trash, will be enclosed. The company also needs a spot that is easy to reach in a suitable location, he said. "We don't want to be in the middle of a neighborhood," Lynch said. "There will be trash trucks arriving and leaving." Lynch said the company is still working on selecting and purchasing a site, so he did not reveal any of the locations being considered, and he would not name the municipality where the sixth site under consideration is located. Chicopee Mayor Richard J. Kos called the project a sizable one for the city and also an important one in handling one of the region's biggest problems. "It is incumbent on us to explore all feasible ways to handle our waste," he said. "Unfortunately, the current technology is to bury it in the ground." The issue is especially relevant since one of the first issues Kos had to start tackling when he was elected mayor three years ago was the imminent closing of the landfill where Chicopee dumps all its waste at a dramatically discounted cost. In May, the city switched to a new system that limits the amount of waste people can dump at no cost to one 35-gallon barrel a week, but continues to collect unlimited recyclables at no cost to the homeowner. The new system was created after city employees, Kos and the City Council conducted a longterm study. "It is a major project for our city and it is a major project for the region," Kos said. The plant is still in the preliminary stages. If everything goes as planned, it would open for operation in 2020, Lynch said.